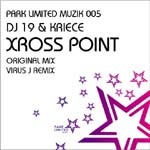 PARK MUZIK LIMITED imprint will return on Sep 15th with a superb tech-house track entitled "Xross Point" made by DJ 19 & Kriece. Virus J provided wicked remix with electro style too. Moussa Clarke remix is a driving slice of old-school piano house that will surely please fans of his past work. This is a peak time stuff, and of course the production is top notch, as you would expect from an artist of Moussa’s caliber. He unleashed his first track in 1994, working with Jamie White under the moniker Party Faithful. “Let There Be House” initially came out on Oven Ready, a label Moussa set up. The track was soon snapped up by XL Recordings and even made the UK’s Top 50. Moussa and Jamie continued to collaborate - evolving into the PF Project, they produced the massive “Choose Life”, which sampled the actor Ewan McGregor’s anti-establishment rant from the cult movie “Trainspotting”. Starting out as a cool bootleg for the clubs, the track exploded into the Top 10 when Positiva officially released it in 1997. Moussa and Jamie returned to the charts soon after as Tzant, with a ubiquitous speaker freaker called “Sounds of Wickedness”, then Moussa hooked up with Nick Hanson under the alias Musique to deliver “New Year’s Dub”. Their ballistic bootleg was signed to Universal back in 2001 – the year Moussa’s Miami Winter Music Conference took an exceptionally surreal twist when Universal sent the starstruck pair to meet U2 in Florida to film the video for the single. As a producer par excellence, he has built up a mind-blowing body of work over the years and his name is credited on more than 150 tracks and remixes. He has remixed a huge range of artists, including Adamski, Afrika Bambaataa, Monie Love, Nitin Sawhney, Phats & Small and more recently, Simple Minds, Wally Lopez and Jody Wisternoff. OMB remix takes the tune into a deeper direction. OMB is Daisuke Yamagishi’s solo project who is running FRAME RECORDINGS. Valid Evidence hails from Tokyo and is a production duo. Named checked by the likes of Afterlife already. They will release a debut album "This Is A Journey Into Sound" in Sep. For this release, Valid Evidence takes influences from Art Of Noise and produce a stunning chillout soundscape. 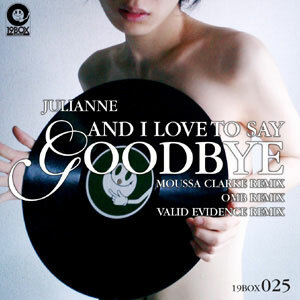 The new single from 19BOX RECORDINGS, Julianne's "And I Love To Say Goodbye" has been causing dancefloor havoc after heavy rotation from the likes of Jody Wisternoff , Andy Moor and Matt Darey. Due for release on 31st August 2008 at beatport. it It will feature strong remix from Moussa Clarke along with Japanese remixes from OMB and Valid Evidence. One of the best dance magazine, 365MAG(ex:Xpander) reviewed C-JAY & DJ 19's "Nether Cutter". You can find many mistakes there such as tracklist and tittle and so on. But it's pretty cool. PARK LIMITED MUZIK(sister label of 19BOX RECORDINGS owned by DJ 19) is proud to unveil its first release for 2008. Creative Aussie producer KRIECE returns with DJ 19 to release another groovy tech tune "Xross Point” plus hot remix with bigger electro bass by VIRUS J. Over the last 10 years the name KRIECE has become synonymous with dance music in Australia. KRIECE initially made his name as a DJ, supporting names such as SASHA, DIGWEED, CATTANEO and JAMES ZABIELA on Australian tours such as Ministry of Sound, Renaissance and Cream. As a producer, KRIECE has gained worldwide recognition for his production work. After a solid debut on EQ Grey Records, KRIECE came to the attention of many with his remix of APHEX TWIN’s “Windowlicker” which was licensed to Renaissance for JAMES ZABIELA’ s “Utilities” CD. In 2005, he teamed up with JAMES ZABIELA & JEFF BENNETT to record “We Make Contact” as THE FLYING DOCTORS. Beside, 2007 has been spent touring the UK and working on material for his album on 20:20 Vision. And he’s also known as a pro-Japanese, cos he used to live in Japan before. So this is a necessary collaboration with Japanese house king DJ 19. VIRUS J a.k.a. Justin C is definitely the most involved Lithuanian DJ / producers from the little few there is. His tracks have spread widely across the global dance floors. His first debut was back in 2000 when Lithuania’s national radio station started broadcasting his track “Isgirsk” which featured a voice of national singer Aiga. Later on Virus J released numerous tracks on a world renowned label such as Distraekt, Big Love, „Benchmarc, Adjust Recordings etc. Remixes for DEEP FOREST, RUI DA SILVA, JIVA (SULTAN), DJ PIERRE, MASHTRONIC, NARANY and MTV award winning JURGA SEDUIKYTE have made a big impact in his fast rising career. Despite all this Virus J feels like it‘s only been a start so far and that the best is still to come. His tracks were supported and appeared in various sets by SASHA, JOHN DIGWEED, MARCUS SHULZ, HERNAN CATTANEO, FLASH BROTHERS, PILIAVIN & ZIMBARDO, DJ 19, ANTHONY PAPPA, MARCELLO CASTELLI, CHUS & CEBALLOS, HYBRID, DEEPSKY and the list goes on.